Who pays when day laborers are injured while cutting your grass? WORK FOR HIRE While homeowners can be sued by injured day laborers, the workers are the ones most at risk. Gov. Jerry Brown signed the landmark Domestic Worker Bill of Rights into law in 2014, but there was some fine print: the law extended overtime benefits to a class of workers previously left out of wage-equity efforts, yet the rights will expire on Jan. 1, 2017, subject to renewal or rejection by the Legislature. The many-thousands-strong state domestic-worker workforce is dominated by immigrant labor, much of it historically of the low-pay and often undocumented variety. The new bill was a great deal for those workers; it was always easy to rip off or underpay domestic workers, some of whom would just as soon stay in the shadows and not rock the immigration boat than fight with a chintzy employer over just compensation. As the Jan. 1 sunset date looms, revisiting the 2014 law raises another question about a class of workers left out of the final language enacted by the Legislature and signed by Brown. 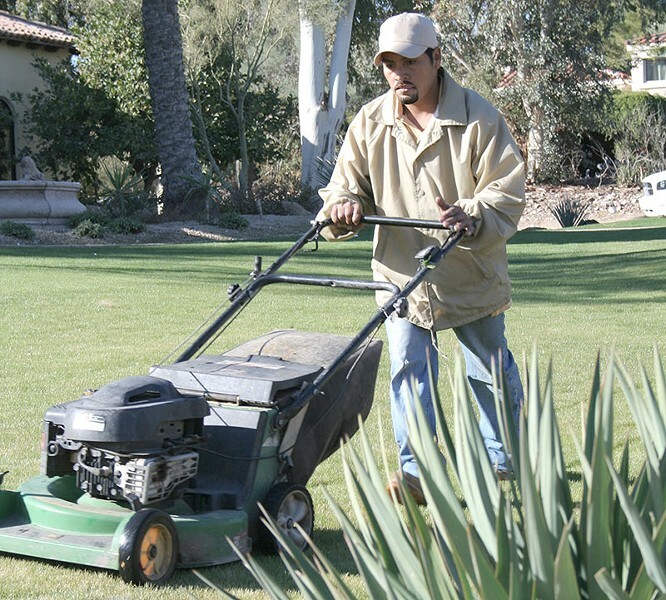 Overtime reform is one thing, but how about worker protections for those who don't work a whole lot of hours, the visible and casual workforce that does all kinds of work around the yard, grass cutters and yard-maintenance crews out in force as the fullness of spring unfurls? As legislators considered the Domestic Worker Bill of Rights in 2014, the first versions of the bill contained another reform directed at those casual workers, way down at the bottom of the text. The reform was designed to close a gap in workers' compensation coverage for low-hour laborers, but it never made it out of committee. The proposed language would have eliminated a section of state labor code, enforced under the aegis of the California Occupational Safety and Health Administration (Cal-OSHA) that says short-term, casual employees are only eligible for workers' compensation benefits after working a minimum of 52 hours over 90 days (workers have to make at least $100 in that time). Casual workers and day laborers who fall below the line are not considered "employees" under state labor code. Under California insurance law, a homeowner's insurance package has to include workers' compensation protections for workers at the home who are deemed to be employees under state law. The implications are obvious. If a casual worker who is not considered an "employee" under state law is injured on the job, the homeowner could be sued for whatever medical or other expenses ensue—even if such lawsuits are rare. "The laws don't match the daily phenomenon that has gone on for the past 20 years," says Jesús Guzmán, lead organizer at the Graton Day Labor Center. The past two decades have seen the advent of a visible day-laborer economy dominated by immigrants, and the establishment of places such as Graton. The day laborer workforce has expanded, but the coverage gap still exists, and Guzmán says the liability almost always falls on the worker's shoulders. He shares the story of an area day laborer who fell off a ladder and sued the homeowner, but because he hadn't reached the 52 hour threshold, the homeowner's insurance didn't cover the injury, "so the worker carried the full brunt of the injury and couldn't work for two months." The original language in the Domestic Bill of Rights eliminated the 52-hour rule, and thus closed the gap in coverage that leaves workers unprotected and homeowners potentially on the hook for medical bills. "Almost all of the risk and liability falls on the worker," Guzmán says. There's no indication that legislators will try and reinstate that language in a re-upped version of the bill. The bottom line for homeowners? All the law firms that specialize in this kind of litigation say the same thing: As you tool around the home and garden, making the to-do list and looking for laborers, always work with a licensed contractor when one is required, and make sure that your homeowner's insurance is up to date. Guzmán says the Graton center will tell homeowners who call in looking for a worker that "if someone is injured, they are responsible for them. We make it clear that they are responsible for the worker. Homeowners can ask their agent about their coverage, but we don't tell them that the insurance is covering them. It's a challenge for us, because it exposes workers to a system where they are really vulnerable and they are the ones with the most to lose when they are injured." For its part, the Graton shape-up center goes the extra mile to keep its workers safe, Guzmán says. Before anyone goes on a job, "we communicate and do intensive training around health and worker safety," he says.